I will send you a picture of a Northern Electric that maybe you don't know of. It is the precursor of the Baby Champ, I have been told. It was the last model made by Northern before the production was turned into war production in the end of 1939, and after the war it was the first model to be assembled for the public, with the parts left in stock from the 1939 production line. 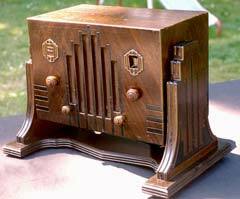 The radio is identical to a Baby champ only it is wood and has a phono plug and switch in the back. My uncle was working as technician for Northern during the war. He did send it, (the photo above) and told me more about it. Here is the picture of my "Baby Champ's grandfather". 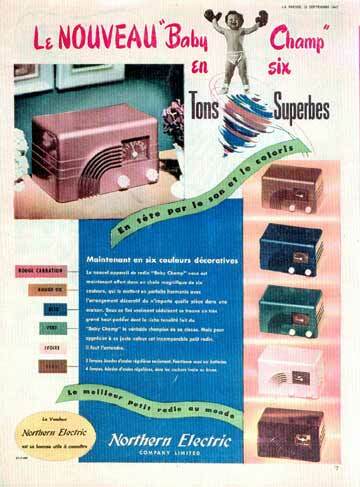 I say it is a Baby Champ because it is the same radio, same chassis, same circuitry, same dial as the 1946 Baby Champ. 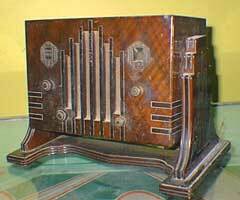 The only difference is the wood cabinet and the phono plug and switch in the back. Unfortunately the model number is not visible on the back, they were probably not calling it a Baby Champ in 1939, but it is indeed a 5000. Baby Champ was a name they used for a marketing blitz, and it stayed for a long time on different models. 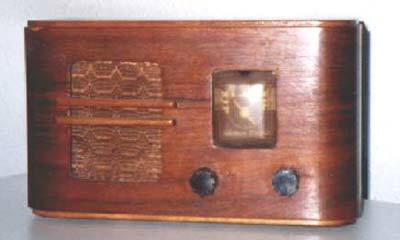 The radio is in its original shape, except for the speaker that I replaced when I was 17 for an oval speaker to get more bass, typical of my teenager years. It died on me a month ago so I will have to fix it and at the same time I will install a speaker like the original and try to remove the yellowish from the plastic cover. The only thing missing is a piece of wood in front of the speaker, you see 2 right now, the third one, the lowest fell about 20 years ago and my mother lost it. A friend of mine who is good in [cabinet making] will make me one. If you wish you can use the picture on your site. Unfortunately my uncle who was a Northern tech, and could have answer many questions, died about 15 years ago, but as I told you before, the story that was told to me by my father is that this it is the last production model from Northern in 1939. They switched to war production, and in 1945 it was the first model offered to the public, built with the leftover from the 1939 production line. Yes the dark spot over the dial is a pilot lamp, and the knobs are perfectly identical to the one the other Baby Champs use. The cutout for the dial face looks narrower than the one on the model 5000, but the graphics and pointer look the same. Two different examples of this wooden set made in 1934/35. Five-tube autodyne circuit, uses AC power. The cabinet tilts back at least 45°(possibly more) and is only about the size of a rainbow Baby Champ. The one at the right is owned by Chris King. Check out his Radio Page, with a number of other Canadian sets. I must ask someone if the weight of the power supply transformer causes it to tend to stay upright, or is it mounted near the pivot point?. Here's an ad for the Baby Champs from the Montreal newspaper "La Presse". Also have a look at the Index of Northern Electric Data Sheets in RCC Manuals.